Constructed with a diameter of 19mm, this specific example of our 18×7 stainless steel wire rope is one of the sturdier products in our line up. It offers identical advantages to our other stainless steel ropes in terms of corrosion resistance and aesthetic appeal. While this 19mm 18×7 Stainless Steel wire rope may seem relatively narrow, it is deceptively strong and provides a load capacity of 18,950kg. Add to that its breaking force rating of 186kN and you can see why it might be well equipped to take on a number of potential duties. The fact that this rope will not rust is another important positive. From light rain to complete immersion in seawater, extended exposure to moisture will not prove problematic. 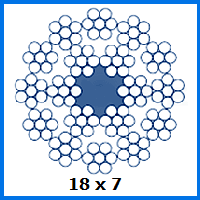 There are strand configurations within this range that are more varied and stronger, such as our 6×36 rope. However, with its low-abrasion surface, 18×7 rope can be superior, depending on your circumstances. With a little help from Rope Services Direct, your stainless steel rope order can be transformed into something genuinely unique. We can use fittings to craft custom assemblies and effectively endow you with the gear you need for lifting, construction or any other important project. You can rely on our experts to give helpful advice and come up with a competitive wire rope quote when you call them on 01384 78004. You can also email RSD with any query and expect a reply to be sent as soon as possible. 19mm 18x7 Stainless Steel Wire Rope Overall rating: 5 out of 5 based on 6 reviews.